I am absolutely terrified of heights and looking over the edge of a mountain scares me to no end. But I do believe that, once a year, I should do something that scares the hell out of me. When I read about taking a hot-air balloon and drifting across the beautiful landscape of Cappadocia in Turkey, I decided that this would be my brave thing for the year. I am so glad that I did not let my fear keep me from this amazing experience as it ended up being one of my most memorable travel moments ever! That morning after getting up early I got to glide above the unique rocks and valleys of Cappadocia as the sun came up and lit up the valleys below. The sky was filled with colourful balloons, all with 10-28 passengers per basket. Although there were hundreds op people on this morning adventure it felt very serene and peaceful. We are so close to the rock formations! I was happy enough to stay at this hight and just cruise along…..
After a while of drifting I dared to look over the side of the basket and admit that it wasn’t as scary as looking over the side of a very high bridge. I did not dare move around and stood there clinging to the basket but also enjoying one of the most beautiful views I had ever seen. It took me a couple of minutes to work up the courage to let go one hand so that I could take photos. But once I got to see the valleys through the lens of camera I had all the courage needed to capture it on film. It was quite dificul to get a shot without a hot air balloon caught in it. 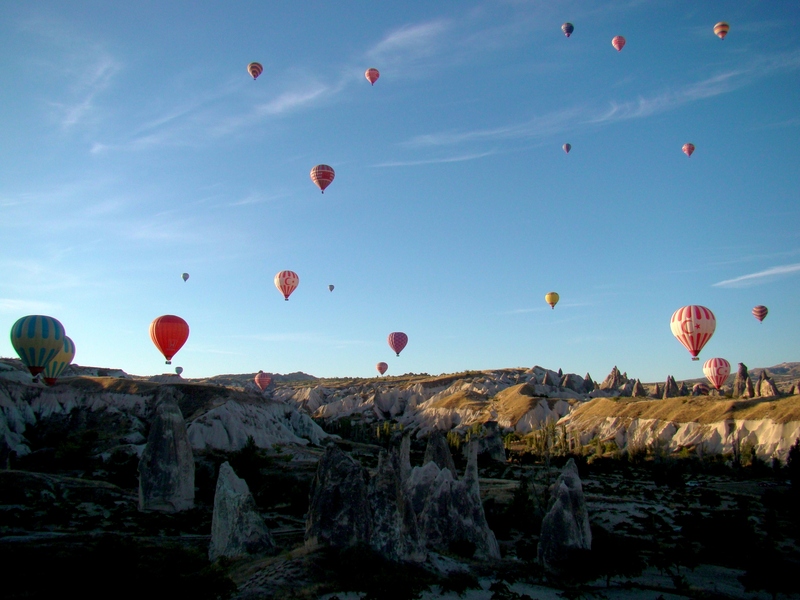 Propelled by the breeze, we drifted over the valleys and iconic fairy chimneys of Cappadocia. I got to enjoy breathtaking panoramic vistas and at times we made descents that almost allowed me to touch the rocks! We floated above the valleys for nearly an hour until wind and fire floated us gently back to earth. I for one was very glad to be out of the floating basket and have my feet firmly on the earth again. My legs were shaking but the views made this scary experience amazing and one I would actually go and do again. I would actually do it again, it ws such a beautiful sight! Beautiful! Cappadocia is on my bucket list. Im sure you are mighty proud of yourself for doing this. Well done! Thank you! 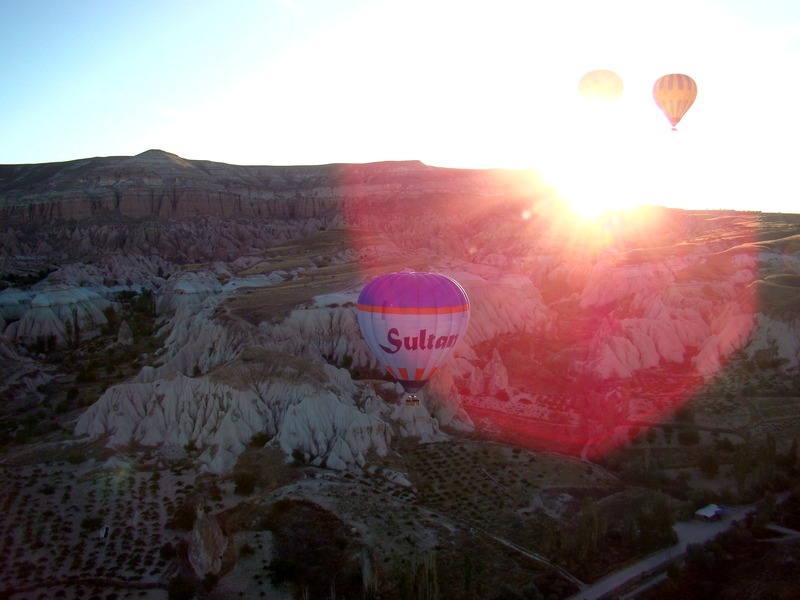 I do hope you dont have to wait too long before you explore Cappadocia, it is amazing! so many places to go, so little time! 😉 we’ll get there, eventually. Superb! Must have been doubly rewarding too, since you went through with it despite your fear! Although I missed cepturing the sunrise because I was frozen in fear it was definitely amazing! And I would actually consider doing it again. That’s great! I find it very encouraging to look back and realise that I tried, and overcame certain fears. In a strange way, it takes the experience and makes it much better! you are braver than I! However, how amazingly rewarding! Thank you. It took a while for my legs to stop shaking and I couldnt sleep the night before, I was so afraid, but it was definitely worth it. It is definitely a must if you are ever in Turkey! Wonderful pictures. I am glad you overcame your trepidation and went on the balloon ride. I’m not sure I could. Thanks for taking us along on yours. Thanks Marie! I think I might actually go on a balloon ride again some day, it was such an amazing experience. Those views are worth it! And you feel a bit safer inside the basket that standing next to a cliff or looking over the side of a mountain. Good job on the ride 🙂 Congratulations. The views and the photographs are beautiful. Thank you so much! Took a while for my legs to stop shaking once we landed but it was so worth it. We took a balloon ride over the vineyards of Australia during our journey there and the peacefulness of the dead quiet was amazing. I’ll never forget the moment we broke through the clouds as another balloon nearby floated into view and the sun sent out spikes of light and warmth. I agree with you it’s an experience not to be believed that will stay with me forever! I would LOVE to do it over Capadocia some day! Your balloon ride sounds just as amazing! Seeing a place from above is so different from just walking through the area. It is amazing and gives you a fabulous overview of what the area looks like. Cant wait to go on another balloon ride! I am so glad Vincent. 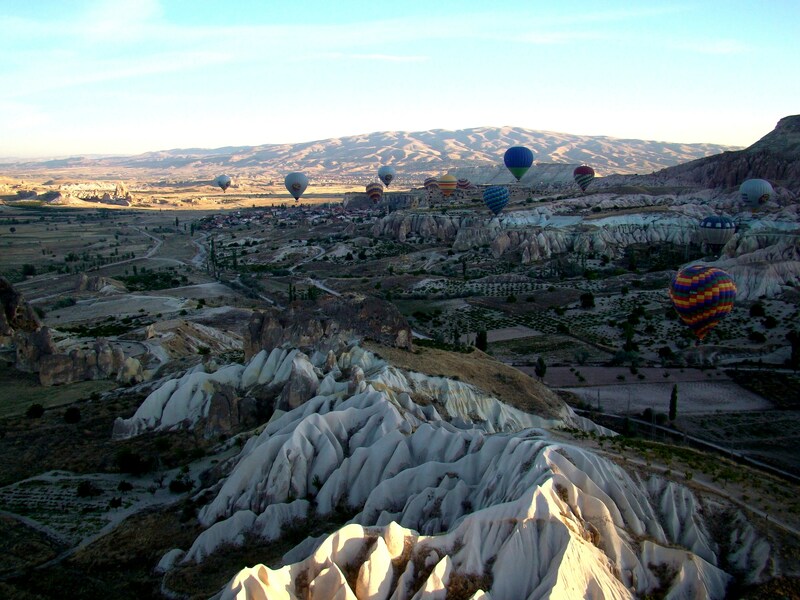 It is an amazing place and make sure you do the hot air balloon ride, it is just fabulous! This is on my bucket list. Great shots. I’m glad you overcame your fear. Thank you! I am still afraid of heights but for some reason I would definitely do a hot air balloon ride again. Especially over an amazing landscape like this. Wow. Well done. Incredible photos too! Love it! I’m not good with heights, but I do fancy doing this! It is definitely worth it Sue! I was frozen in one spot but as soon as I started taking photos I forgot how high up we were and actually enjoyed the view. It was amazing. Well, you’ve made me think perhaps I will do this!